Dog-ski Surprise - Adirondack Backcountry Alert! 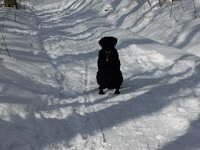 Yesterday's ski started out as an "all about Puz-the-dog" ski. This was my effort to alleviate the guilt of not taking him skiing for many days. We even invited Belle, one of his many girl friends, and her owner Ben. Belle is a stunning chocolate lab with great legs. Since it was supposed to be just a short dog ski on the Jackrabbit Trail, we packed lightly, foregoing the usual water bottles and snacks. After climbing for about 20 minutes we noticed the snow was getting deeper, a surprise since backcountry conditions went right down the tubes after all the rain we had a few weeks ago. We decided to check out an Adirondack bowl to see what was left for snow. Much to our pleasant surprise, there was about 10 inches of untracked, fresh powder on a solid base! This particular bowl is known for getting and holding good snow, but conditions this great were a shocker. Naturally we had to stay out longer than planned and ski until exhaustion, hunger, and thirst forced us to head home. So, I am pleased to report the Adirondack backcountry is back and has great skiing. Here is a link to photos of yesterday's excursion.